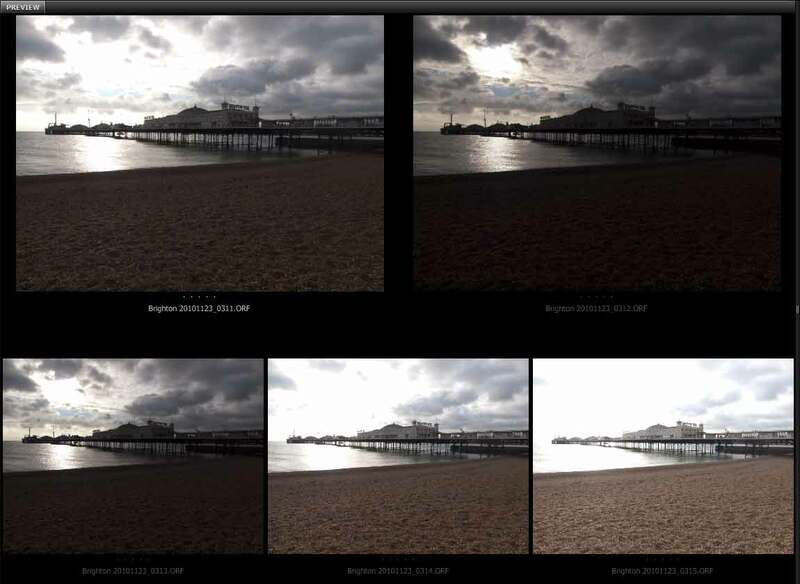 As you can see, the pictures are exactly the same view (it is worth using a tripod to ensure as little movement between images as possible), but each one is either lighter or darker that the others. 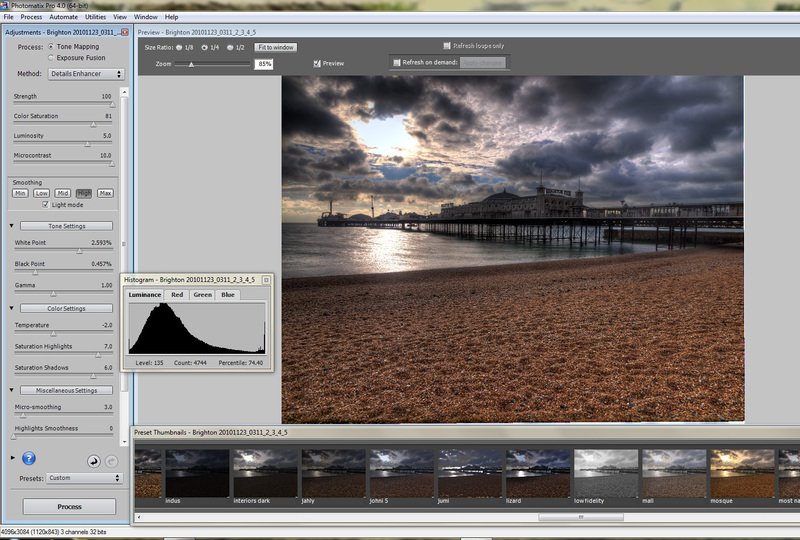 The allow you to change some of the preprocessing options in Photomatix. Always select “align source images” and pick one of the two alternatives. If you don’t you will get a ghosted effect where the camera may have moved between the shots. I always leave the “Reduce Ghosting Artifacts” box ticked. This one tackles a slightly different problem where something in the image may have moved between shots. In this particular image there is no real ghosting caused by moving objects so I just clicked OK.
Then you will see a window like the one below. Depending on how fast your computer can crunch this may take a little while to appear. You will notice a “film strip” along the bottom. 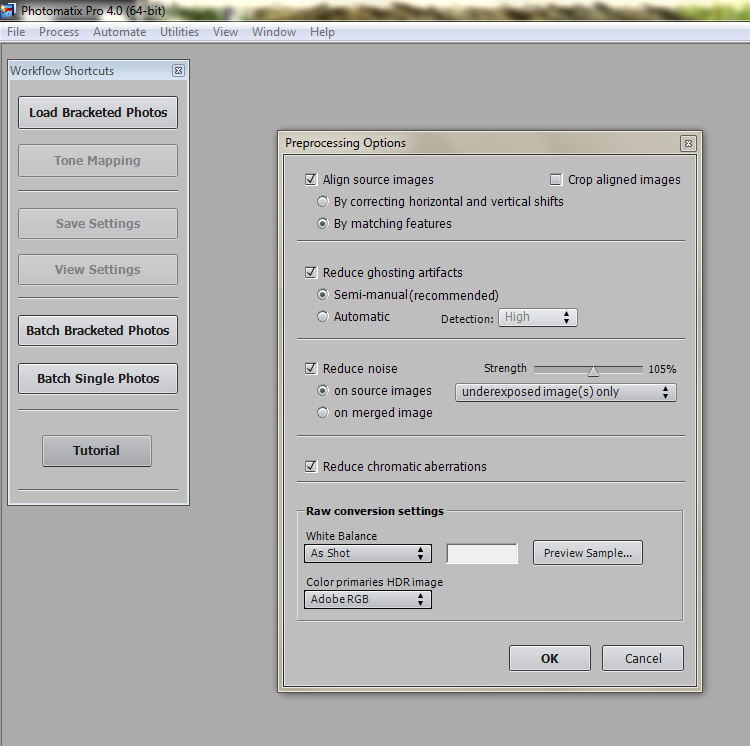 This give thumbnail views of presettings to show differing effects. When you find one you like click on it. The bar dow the left contains tools to allow fine adjustments and manual overrides. You need to save this image by going to file “save” or “Save as” and chosing the location to save it in. I do not like the very bright area of sky in the top left so let’s do something about it. 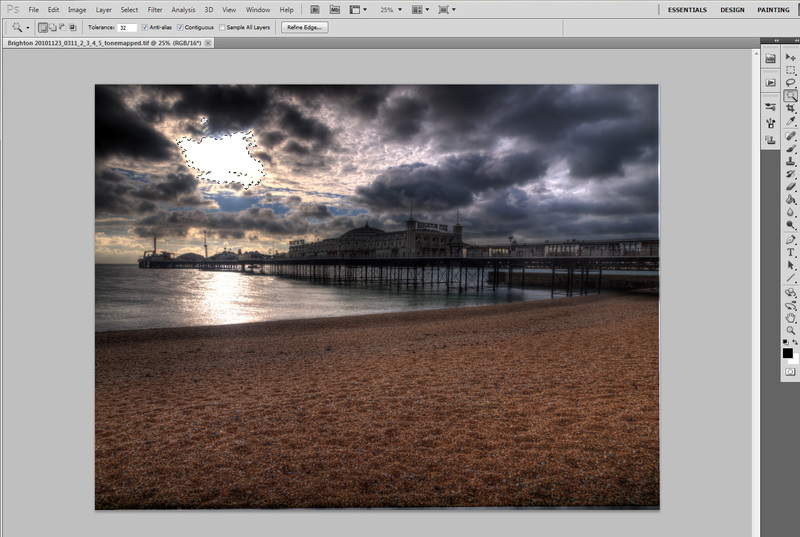 As you can see above I have selected the bright area; I did this by using the magic wand tool. 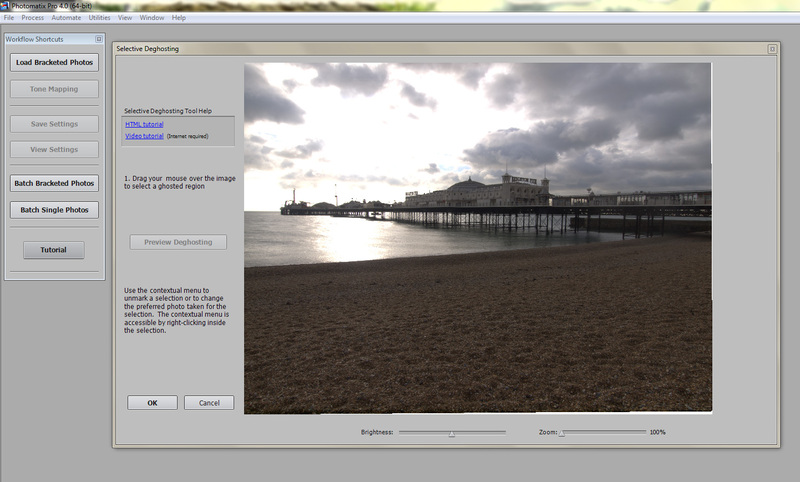 Ensure that the content aware box is ticked and press OK. 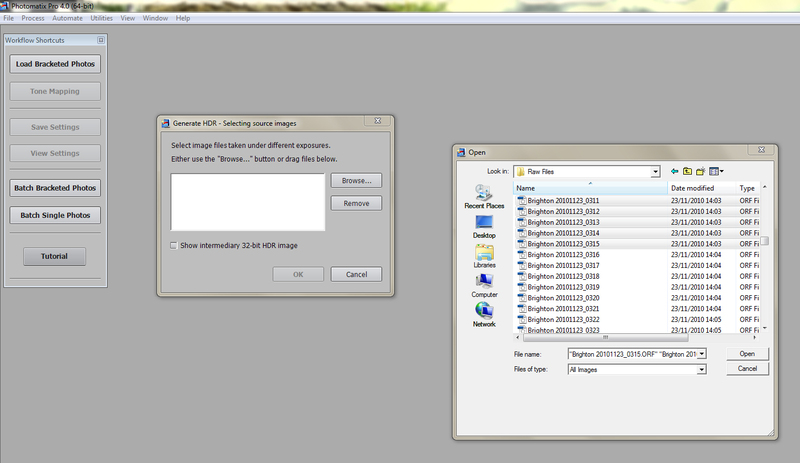 I Should point out that “content aware fill” is only found in the latest versions of Photoshop. It is very simple, however, a similar effect can be achieved by use of the cloning tool. 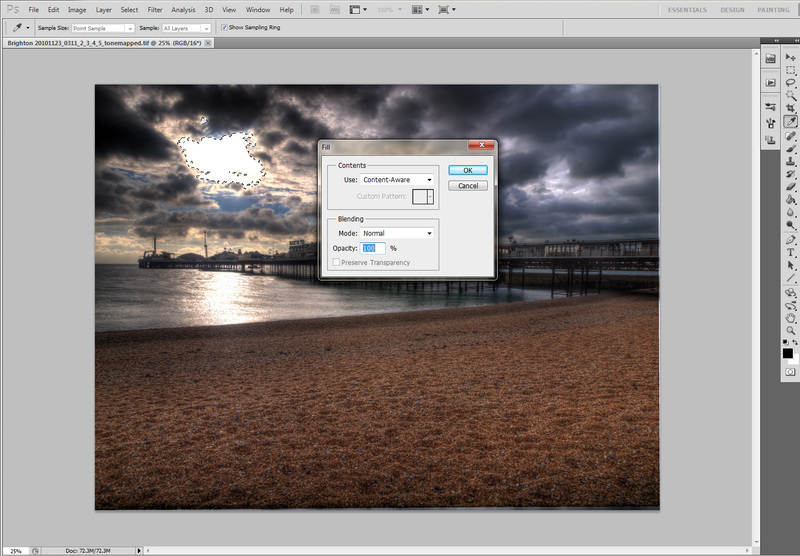 As you can see, Photoshop has done a pretty good job of filling in the blank area. 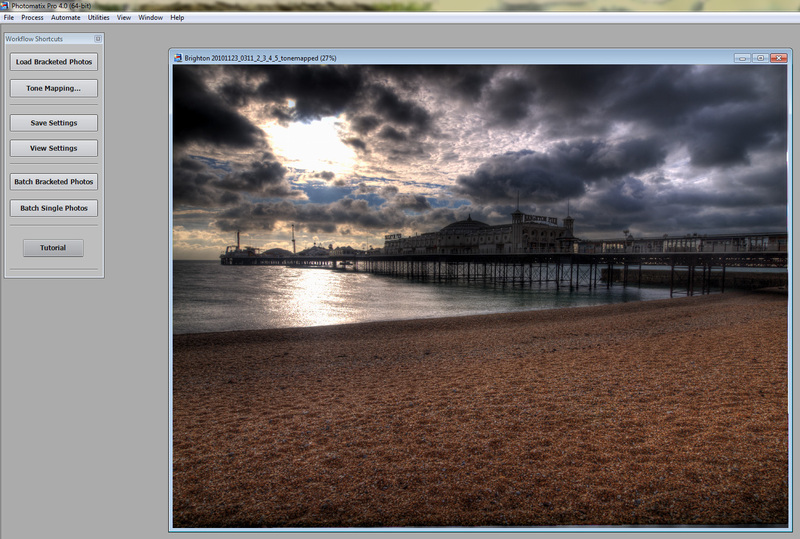 You will also notice that in this step I have used the dodge tool to lighten the sides of the buildings on the pier. 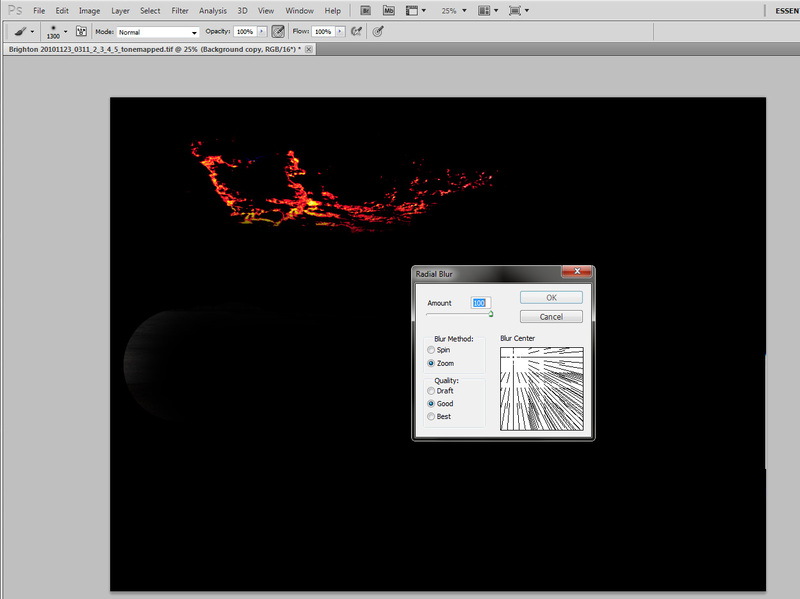 The next step is to duplicate the layer. This is so we can start to create the rays of light. 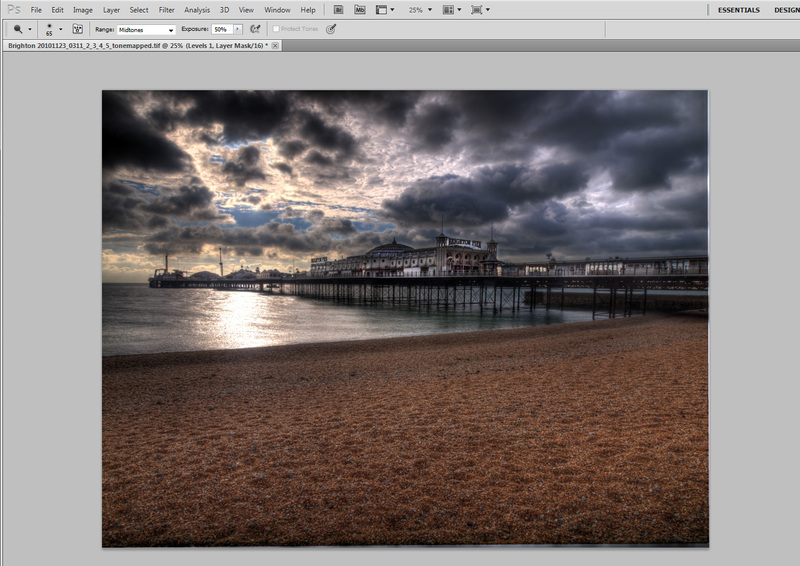 By using the levels controls in Photoshop (I only want to see the highlights in this layer) I have moved the black selector most of the way over to the right. 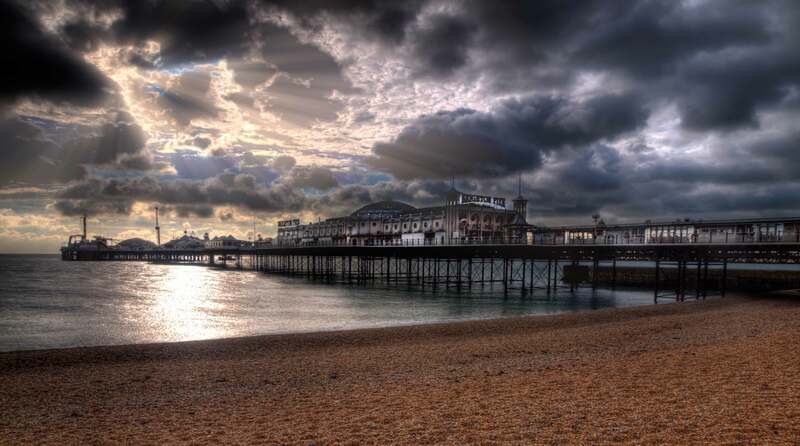 This shops the very light areas in the sky and also the sea. 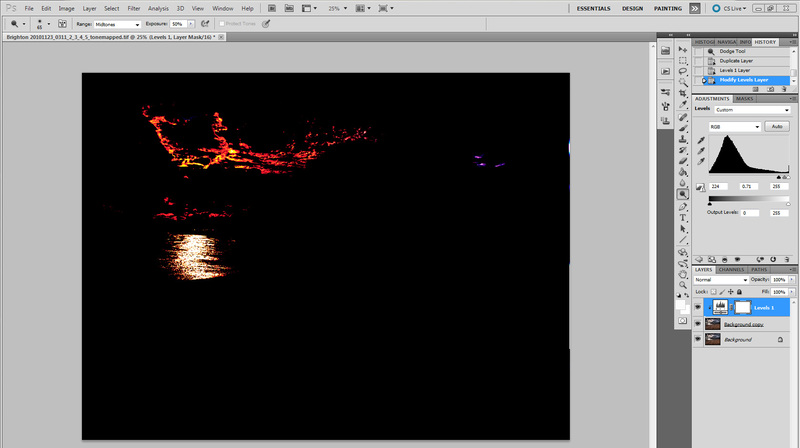 However because I do not want light rays to radiate from the sea, I use the paint brush tool set to black and paint over any “light sources” I do not wish to use. I have set the amount to maximum, chosen zoom and chosen good quality. You will notice in the right of the dialog box, there is a graphical depiction of where the radiating effect will originate from. click in this box and move the origin around until it appears in the same place as the light sours in your picture. Then click OK. You can repeat this two or three times to maximise the effect.